There have been many such incidents in history that have made us today. It is said that success is sometimes one day's work, it takes many years to build its foundation. Due to being a prosperous country of India at the ancient times, many outside invaders attacked India, who tried to rob it, then somebody tried to regain their power here. The British also ruled India over 200 years. During this time, the British did not only make India slaves but also split many of them. Millions of countrymen struggled to get rid of British atrocities and to live in an independent country. Many incidents took place due to the movement of independence; But the incident which was the most tragic incident was Jallianwala Bagh Massacre - The incident of Jallianwala Bagh. More than 2 thousand people were injured, who had killed 400 Indians. But why this massacre happened and as a result, what happened in the country, we know in our today's article. Jalian Jiwala's subsequent incident took place on 13th April, 1919 in the Jallianwala Bagh near the Golden Temple in Amritsar city of Punjab. But its sparks began to flourish from a very long time. However, still no one thought that the British would give a sample of their dictatorship in this way. Actually, World War I was fought between 1914 and 1918. During that time, the leaders of India, the public had given full support to Britishers thinking that maybe after this, Britesh would leave India. During the First World War, 45 thousand jawans were also martyred fighting the war because of this hope. But after World War, the story got a different look. Indeed, seeing the growing dictatorship of the Britishers, the demands of freedom from both Punjab and Bengal started rising in the face. The British company had also formed a committee to review this matter so that they could find out that in these movements there is no external element in their movements. However, the fire of protest against Britesh in Punjab was rising from the time of the World War. Because of which the British had implemented the Rowlatt Act in India. The main purpose of this act was to prevent the ongoing movements in the country. Because of which censorship was also put on the press during that time. Under the Act, the British government could put any leader in jail without trial. Apart from this, the people could also arrest without any warrant. Because of which, the demand for independence in the country after the world war started rising rapidly. 13th April 1919 was the day the festival of Baisakhi was celebrated in Punjab Haryana. And just like every year, the fair was organized for Baisakhi. 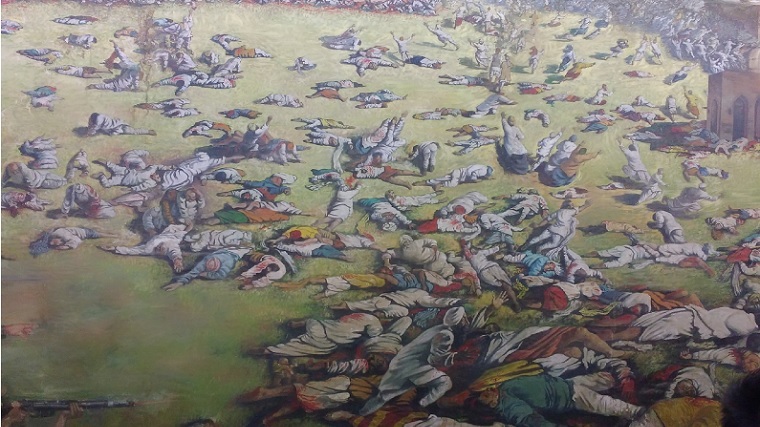 Which was held at Jallianwala Bagh. A meeting was held in this fair, which was opposed to the British Act of the Rolat Act. But on the moving assembly, British officers under the leadership of General Dyer started firing on this gathering. More than 2000 people were injured in this cache of which more than 2000 people were injured. However, there is a slight reshuffle in these numbers in different departments. According to reports, 337 men, 41 boys and a child of one and a half months were also killed in this massacre. The British Empress Elizabeth and British Prime Minister David Cameron, on the massacre, also mourned this as one of the most shameful events in British history. He came here and gave a tribute to the dead. The British government was thinking that after the massacre, the movement for freedom in the country would be stopped but as a result the country's resentment in the public increased. And the flame of freedom which was burning in some corners of the country till now. Now he started burning in one form all over the country. This massacre gave birth to freedom fighters like Shahid Bhagat Singh, who were only children at that time. At the same time, after the massacre, non-cooperation movement was started throughout the country under the leadership of Mahatma Gandhi.